Curried Tomato Soup is based on two of my favorite dishes: tomato bisque and Indian butter chicken. Growing up I always ate the Campbell’s Tomato Soup. Up until recently, this was our go-to tomato soup. That was until I learned to make a solid tomato soup on my own. If you’ve never been to an Indian restaurant, shame on you. My local Indian restaurant isn’t well visited by the locals, which is unfortunate because I believe they have some of the best food in town. My absolute favorite dish at this restaurant is their butter chicken. Butter chicken is a spiced (but not a hot spice, think cinnamon, cardamom, etc.) tomato and coconut milk sauce that is used to simmer dark meat chicken. It’s absolutely fantastic with an order of garlic naan. 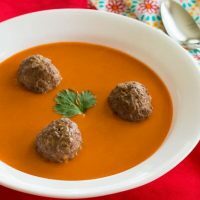 Anyways, one day while eating butter chicken with my wife during lunch, I had the thought of smashing together our tomato soup recipe with a butter chicken recipe. Curried tomato soup is our final result after tinkering with this recipe. 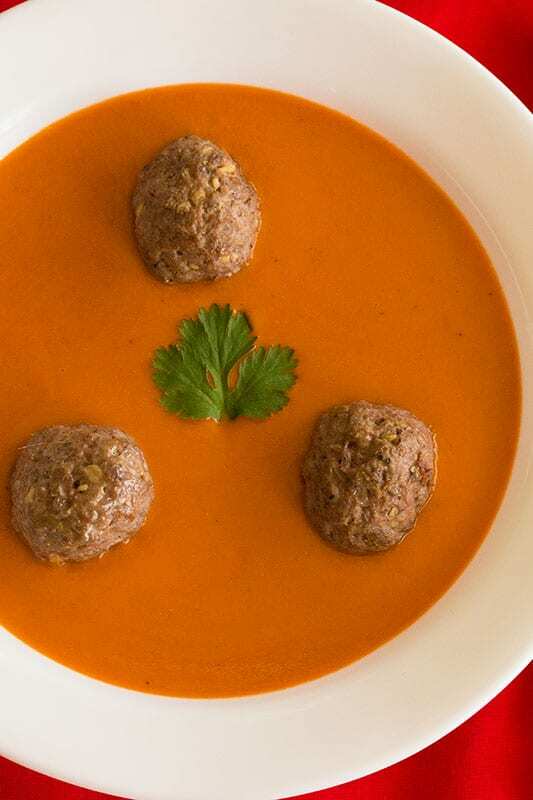 We have also discovered that this recipe goes extremely well with our Indian Spiced Meatballs. 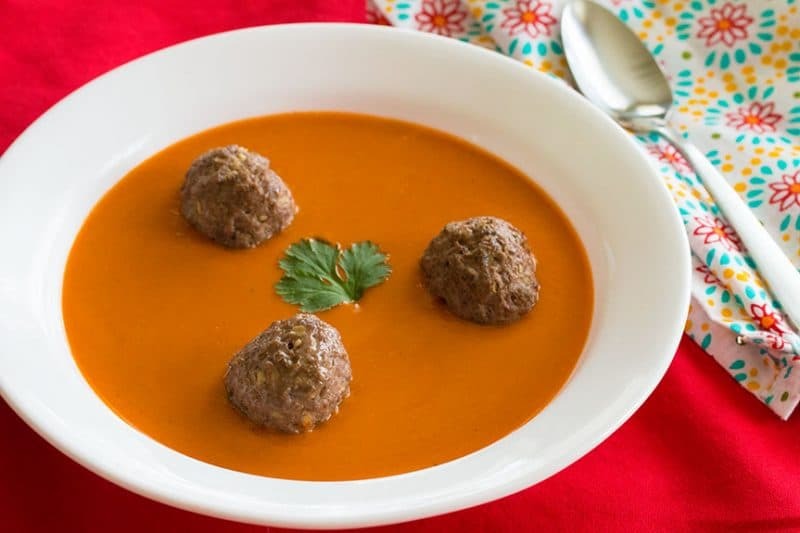 Just toss the meatballs directly into your soup and you’ll be amazed. For this recipe, you’ll probably need to head to your local Asian/Indian market. The kasoori methi and garam masala will most likely be the more difficult items to find. Since the flavor is so unique, I don’t know where to begin in terms of substitutions. For the Indian chili power, cayenne will work just fine. For some reason, the chili powder we picked up at our Asian market is an order of magnitude hotter than your standard chili powder (which I’m ok with), but you may need to add more cayenne. Before your soup is finished cooking, I recommend you taste your soup and season to your liking. Salt is important in this dish to make it pop. Sometimes I also like to go with more garam masala and chili powder. If you add more spices to your soup at the end, be sure to let it simmer another 10-15 minutes to ensure the flavors are well incorporated. Serve with naan bread or soft homemade flatbread. An Indian spiced tomato soup. Nutritional Calculators differ, please use your favorite calculator and kitchen scale to get accurate information if nutritional information is critical to your diet.